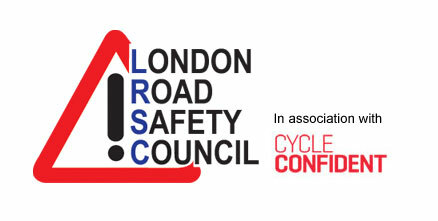 Road Safety Week 2017 – what happened across London? Read about Road Safety Week activities in Hammersmith & Fulham, Kingston upon Thames and Westminster – and the new THINK! child road safety campaign and resources. Organised by Brake, Road Safety Week (20-26 Nov) aimed to inspire schools, organisations and communities to take action and promote road safety messages during the week itself and beyond. The annual event also provided a focal point for professionals working in road safety to boost awareness of, and engagement with their work. Using the theme ‘Speed Down Save Lives’, Road Safety Week 2017 focused on the need to keep to lower speeds, especially in built up areas. Nationally, the THINK! team has chosen the start of Road Safety Week to launch a new campaign targetting children aged three to six years. The campaign features a suite of new education resources including ‘easy to follow’ lesson plans, two new films co-created with school children, and a song. The new resources are designed to make teaching road safety in schools ‘easier and more accessible’. The new campaign is launched on the back of a recent THINK! survey which revealed that 67% of children get fewer than two hours of road safety education in their whole time at school. The City of London Corporation’s Road Danger Reduction team has published four new road etiquette principles for people travelling in the Square Mile. The City of London Corporation also launched its ‘Be Brake Ready’ campaign, outside Liverpool Street station, to coincide with the start of Road Safety Week. Be Brake Ready aims to encourage drivers, bikers and cyclists to be ready to react instantly to prevent serious collisions. Crossing patrol officers ushered bubble wrap-covered pedestrians across the collision hotspot of Bishopsgate and Liverpool Street junction (pictured below) to highlight how vulnerable pedestrians are compared to other motorists. 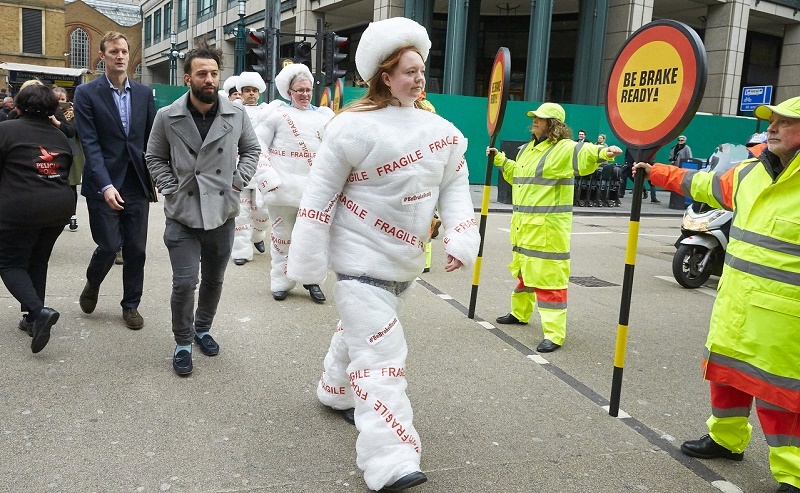 Bubble wrapped pedestrians helped mark the launch of the ‘Be Brake Ready’ campaign. “Seeing as we cannot wrap all of the City’s 480,000 workers and 9,000 residents in bubble wrap, we urge the public to ‘Be Brake Ready’. “Over the years we have seen a big increase in commuters who walk and cycle to work and to encourage this trend we have introduced cycling Quietways, redesigned dangerous junctions and implemented a City-wide 20-mile an hour speed limit. Road safety and parking operation officers from Wandsworth Council are visiting schools in the borough to remind parents to park safely during Road Safety Week. As well as targetting drivers of vehicles who double park and park on junctions or across vehicle access points, officers are encouraging drivers to switch off their vehicle’s engine when parked outside schools, as part of the council’s ongoing No Idling campaign. Wandsworth Council is also working with the Met Police at several schools on the Junior Community RoadWatch scheme. Junior Community RoadWatch, which first ran during Road Safety Week 2016, sees Years 5 and 6 pupils using ‘speed guns’ alongside the police in a bid to reduce speeding around schools. “I know busy parents can struggle to park at drop-off and pick-up time, but bad parking causes accidents and is dangerous for children. “We’re also keen to do all we can to reduce pollution, especially near schools, and to get the message across to people driving past schools that they must keep their speed down. In partnership with civil enforcement and Met Police officers, road safety officers from Hammersmith & Fulham Council are visiting schools and other locations where there is a history of serious collisions, dangerous or inconsiderate driving, and where people are ignoring parking restrictions such as ‘school keep clear’ markings. A series of Community Roadwatch events are being staged, during which police and road safety officers are joining forces with Transport for London to monitor traffic speeds following expansion of Hammersmith & Fulham’s 20mph scheme. There are also a number of Exchanging Places events, in which cyclists and HGV drivers swap places to experience the road from each other’s perspective, and ‘space for cyclists’ events to educate drivers about the distance they should alllow when overtaking cyclists. In Kingston upon Thames, pupils have been working with police and the council’s road safety team as part of a speed awareness campaign in the lead up to Road Safety Week. The Junior Roadwatch events, designed to remind drivers of the dangers of speeding, have been trialled across Kingston. “The Junior Roadwatch events – where we bring groups of school children, wearing yellow safety jackets, to the roadside to speak to drivers after they have been stopped by the police for speeding – have been a real success. Westminster City Council’s road safety team has distributed a simple lesson plan about speed to all schools in the borough. The lesson plan includes a history of, and other facts about, speed, and how to organise a ‘speed trap’. The pupils are challenged to carry out experiments and surveys during the week and record their findings for assemblies. The police community roadwatch team is also providing a demonstration featuring the use of speed detection equipment. Let us know and we’ll cover in a news item during the course of Road Safety Week. Contact Edward Seaman by email or call 01379 650112.